Welcome back to our blog! In our last couple of blog posts, we have briefly discussed the history of locks and gave our readers an overview of the types of modern locks used in homes and businesses. As peanut butter goes with jelly, it is only fair to speak to keys, their history, and types as well. 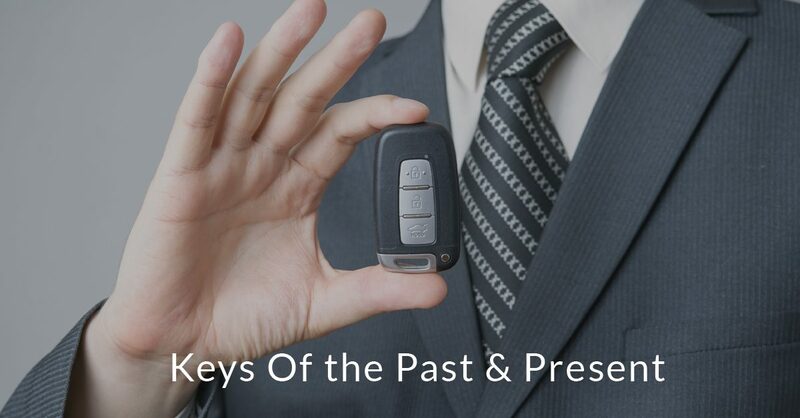 Today, we will cover the history of keys and their locks. As we discussed in a previous blog, it is believed that the first lock and key was used in Nineveh, the capital of the ancient Assyria. Ancient Egyptians also seems to employ their own lock and key with a wooden, pin lock. Romans used metal locks and often used keys that were rings or used those worn around their necks. The invention of the key, however, is attributed to Theodore of Samos in 6th century BC England who invented a key that could be used with an all metal lock. However, there are many cultures that used their own types of keys prior to Theodore of Samos’ invention. Modern keys and their locks were not manufactured until the Industrial Revolution in the late 1700s. Around the same time, Robert Barron invented his double acting lever lock which lead to Jeremiah Chubb’s improvement in response to the British government’s challenge to invent a lock that could only be opened by its own key. Chubb’s key not only won, but also showed if the lock had been tampered with. Chubb continued to improve upon his design and eventually with his brother started his own lock company. Joseph Bramah invented, around the same time as Chubb, an alternative using a cylindrical key; his version not only needed the key, but also the key to be perfectly aligned to open his lock. Abraham O. Stansbury was the first to patent the earliest double acting pin tumbler; a modern version of Stansbury’s lock is still used today. Linus Yale, Jr. invented the first lock to use a flat key with serrated edges—like the ones we use today. His lock very much resembled the locks used by the ancient Egyptians. Over the years these locks continued to evolve into what we have today. Curiously, many of the locks we use are very much like those invented by Bramah, Chubb, and Yale in the 1800s. Thankfully, with the passing years, more improvements have been made to these first locks and their corresponding keys to not only suit the user in improving security, but also through versatility as well. With better manufacturing methods and materials, many of these locks and keys have also gained longevity and ease of use. We hope that you’ve enjoyed this brief history of locks and keys and will stay tuned for a follow up blog about the types of keys used today and throughout history. On our blog, we cover historical and fascinating key topics, as well as those topics that are practical and can help you improve the security of your home in The Woodlands as well. As the chosen locksmiths of The Woodlands, Affordable Locksmith is pleased to provide a variety of services for both residential and commercial clients. Not only can we help you improve your security and update your locks, but we can also let you into your car, home, or business if you have lost your keys. Contact us and we will answer within 15 minutes of your request. Also, if you are unsure about installing new locks or are postponing replacing your transponder key, know that we offer 10 percent off first-time customer service and can replace your car keys at a fraction of the cost of the dealer. Visit our website to learn more and contact us now!